We pass along nearly every day on the road to City Centre .There’s a new fish restaurant in Seeb called Grand Fish Market, just right beside the petrol station on the way to City Centre. The place was huge, there were 2 floors. We were greeted by a concierge man who was smiling and escorted us to the first floor. 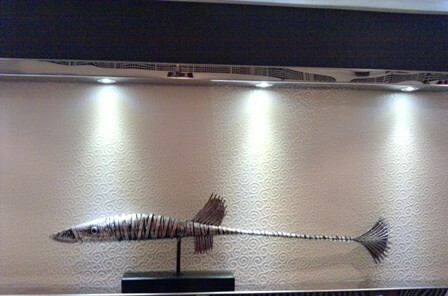 The restaurant is very new, decorated in ‘fish theme’ with many aquariums dividing the areas between the tables. The restaurant was half empty when we arrived around 8 p.m, it’s a new place and they’re attracting new customers. The are is cool and nice, the staff friendly and very prompt. We ordered 2 fish soups, they were tasty, not as aromatic as Tom Yum. Simple and good. The Filipino waiter was helpful to give us some advice, I like it when you come to new place and you find the staff knowledgeable about what do they offer. We ordered Grand fish Market salad and a large fish platter with what they called ‘fish rice’. The food was tasty, just enough for 2 people. I especially liked the rice, to be honest i became fan of rice since I arrived to Oman. We had avocado and orange juices as well as large bottle to drink. The total bill was around R.O 15 for 2 people. The place was all right, the interior just fine and staff very friendly. And we didn’t wait for so long…. 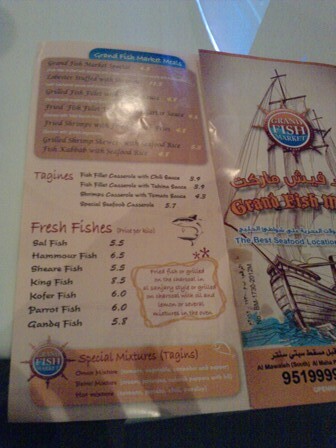 This entry was posted in Food&Drink, Muscat and tagged Grand Fish Market Restaurant, Restaurants in Seeb. Bookmark the permalink. 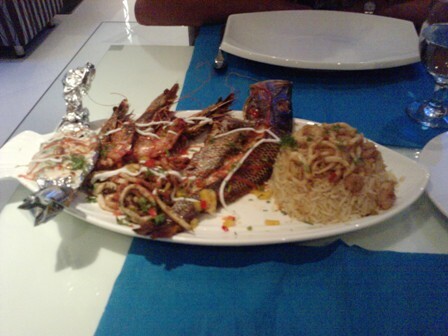 The fish platter looks yummy…. What did that long metal fish on the black stand taste like? Looks a little…wiry! Wish I could be there to try the fish meal you had — it looks quite good. By the way, do you know how much R.O 15 would be in US dollars?